I learned to play chess when I was about 14 years old and have played actively until early 2008. My first club was O & O in Kampen, when in 1974 I became a student in Utrecht I joined Utstud which later renamed itself to Paul Keres. In this club I was a committee member for several years as well. About ten years later I started to play for DD in Den Haag, until I moved to England where I joined the Chester YMCA Chess club. Also, when I was a student, I started to develop my own chess program which competed many times in the Dutch National Championship organised by the CSVN. The best result my program obtained was a shared second place in 1983. It also competed twice (Cologne 1986 and Edmonton 1989) in the World Championship organised by the ICCA (now ICGA). In the Netherlands there is an annual national championship for company teams. I won this title three times: once as a member of the University of Utrecht team, and twice as a member of the Shell team. Of course I could have gone into an endgame by 42. ... Qxd4 43. Rxc6 bxc6 44. Qxe6† Kh8 45. Qxh3 but what is white to do now? 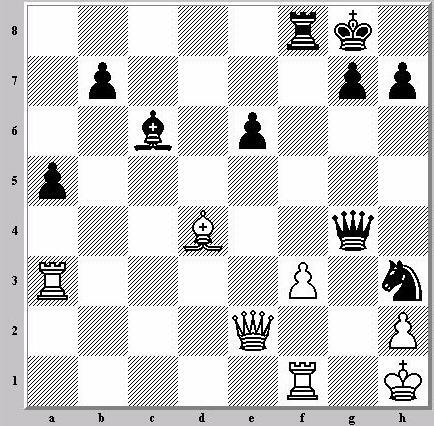 Black threatens Ng5 and white's position should quickly collapse. and here white resigned: 48. Rg1 Qxg1† leaves him with an hopeless ending.